I really like "The Office." That right there is Rainn Wilson. He is fantastic. Even his name is fantastic. Rainn Wilson. Rainn. If this whole acting thing doesn't work out I think he should change his last name and start a heavy metal group; Rainn Destruction, Rainny Days, Rainn of Chaos. Or maybe we could spell it Khaos, that would be pretty awesome too. Anyway, I don't think he gets a lot of credit for it, but Rainn Wilson is one of the big reasons this show is great. Dwight Schrute is just an incredible foil for the other characters to play off of. He's awkward, mean, anti-social, etc. He's the character you love to hate. I just plain love him. Don't get me wrong, Jim, Pam, and of course Michael Scott are all great characters. The show just wouldn't work without them. The problems I have with Jim and Pam are they're clearly meant to be the only characters that you're supposed to like and identify with. Michael Scott is fantastic as portrayed by Steve Carell. The only complaint I have about him is that Michael can be so awkward that some of his scenes are just plain hard to watch. But I mean that in a good way, honestly I do. Anyway, I honestly like all of the characters on "The Office". I just thought I'd take the time to thank Rainn Wilson for his great performance because I don't often hear his praises sung. By the way, I really liked you in "Galaxy Quest" and "House of 1,000 Corpses" too. Rock on, Rainn. Kevin is pretty great too. Edit: I may have been wrong about the credit thing. A Googlefight between Dwight Schrute and Jim Halpert shows Dwight Schrute winning handedly. Also, a googlefight between Rainn Wilson and John Krasinski proves Rainn to be the winner again. Maybe he does get enough appreciation after all. 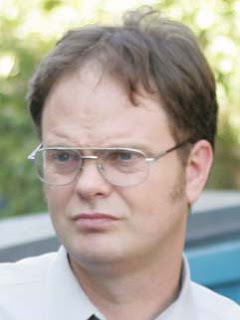 With a name like Rainn Wilson I can see why. Poor John Krasinski.